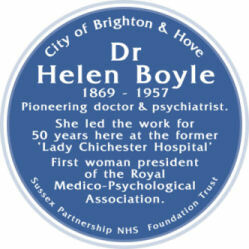 The Mayor of Brighton and Hove, Councillor Lynda Hyde, unveiled a blue plaque at Aldrington House, New Church Road, Hove to commemorate Dr Helen Boyle, a pioneer in the field of mental health. 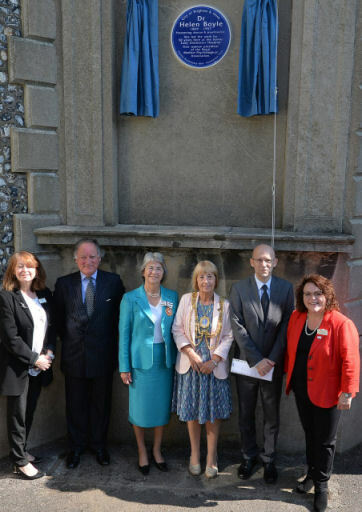 Amongst the invited guests were Phyllida de Salis, Deputy Lieutenant of East Sussex, Roger Amerena, Vice Chairman B&H Commemorative Plaque Panel and members of the panel, Ambassador of Serbia Dr Ognjen Pribicevic, members of the Boyle family and local historian Val Brown who wrote a book on the work of Helen Boyle. Dr Helen Boyle (1869-1957) trained at the London School of Medicine for Women from 1890, qualifying in 1893 with the Scottish triple qualification. With another woman colleague, she established a practice in 1897 in Palmeira Terrace and was the town’s first woman GP. Having previously worked in the East End of London she had first-hand experience of the mental and physical strain on women living in poverty. Helen Boyle’s pioneering work transformed the lives of working-class women in the area through her ground-breaking treatment of mental illness. Responsible for establishing a dispensary and hospital staffed by women for women, she went on to become the first female psychiatrist at the Royal Sussex County Hospital and co-founder of MIND.